From November to February, thousands of Western Monarch Butterflies overwinter near Pismo Beach. All is quiet as you walk toward the towering eucalyptus trees in the Monarch Butterfly Grove near Pismo Beach. Nothing seems to be going on, just a gentle breeze that’s ruffling the leaves. This Western Monarch Butterfly (and thousands of his or her friends) overwinters in the Monarch Butterfly Grove near Pismo Beach. But you pause, and look up. There, high in the branches, black and orange striped confetti flits and flutters, as hundreds of Western Monarch Butterflies take to the air. 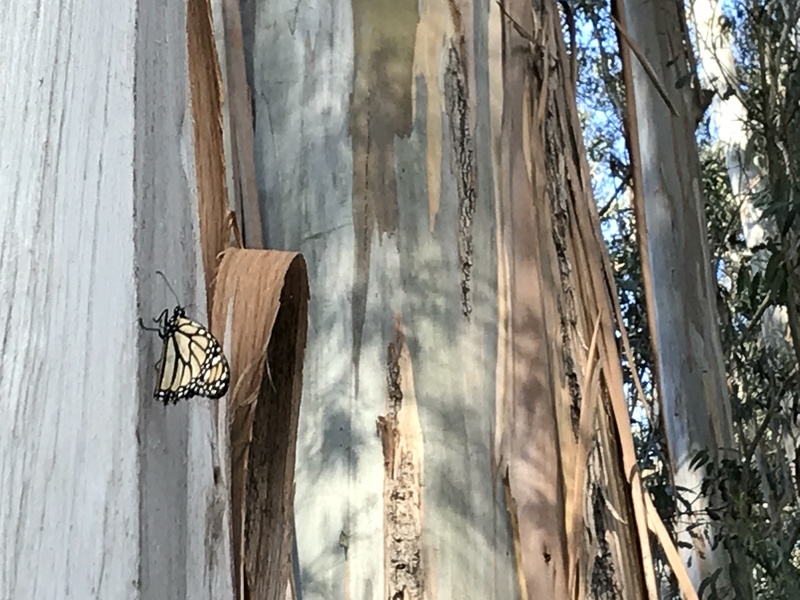 Each year, from November through February, the Western Monarch Butterfly overwinters in sheltered groves of eucalyptus and Monterey cypress trees along the California Central Coast. One of their favorite stops is the Pismo State Beach Monarch Butterfly Grove. Thousands of the brightly colored butterflies gather in the grove. On cool days below 55 degrees, the Monarchs will be clustered in groups for protection from the elements. At first glance, they may look like brown, dead leaves. But look more closely. These clusters of “leaves” will transform into groups of vibrant Monarch butterflies. On warm days, they’ll take to air, looking for a mate. You might be lucky enough to see a burst as hundreds take flight. Watching them is mesmerizing — it’s Monarch meditation. They also congregate in areas around Morro Bay and other Central Coast locations. The butterflies you’ll see in the grove have never been here before. They’re actually four generations removed from last year’s overwintering group. These came south and west from colder areas, perhaps as far as 2,000 miles. When they arrive, they shelter in groups to conserve energy and as protection from predators. As the weather gets warmer, usually starting in late January through March, they become more active as they start looking for mates and food. Adult females lay 200 to 400 eggs on the underside of milkweed leaves. In about four days, the eggs hatch into larvae. These caterpillars feed on milkweed leaves for two to three weeks, grow in size and develop their distinct yellow, white, and black striped coloration. Next, the caterpillar attaches to a sturdy twig or branch and forms the jade-green chrysalis. In about 15 days, the Western Monarch emerges. The new generation finds a mate, lays eggs, and continues the cycle. Those born in the spring and summer live about two to six weeks. The generation that overwinters in the grove can live up to eight months. Located between the Pismo Pier and the Grand Avenue entrance station to Pismo Beach, Monarch Grove is a pretty stop on Hwy 1. Just look west for the signs and parking lot. It’s free and open year-round. If the lot is full, which it likely will be on weekends, park along the road and walk in. 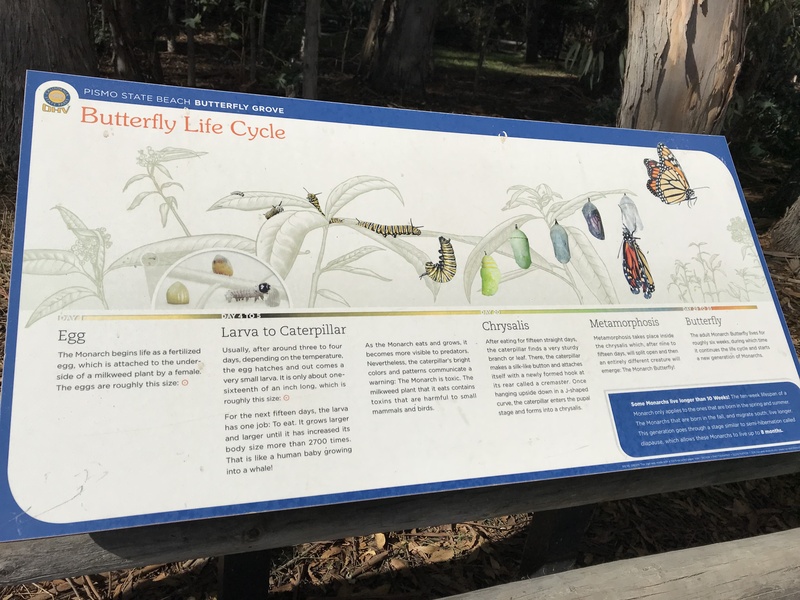 On many weekends, especially in February, volunteers, docents, and California State Parks employees set up telescopes, have an information booth, and give presentations about the life cycle of the Western Monarch Butterfly. And even after the Monarch Butterflies have moved to their summer homes (typically in Canada or the Rocky Mountains), the grove is a peaceful, beautiful place to spend a little time connecting with nature. Be sure to take a little extra time and take the path to the ocean. It’s just a few minutes’ walk through the trees and dune vegetation before you find yourself at the waves. 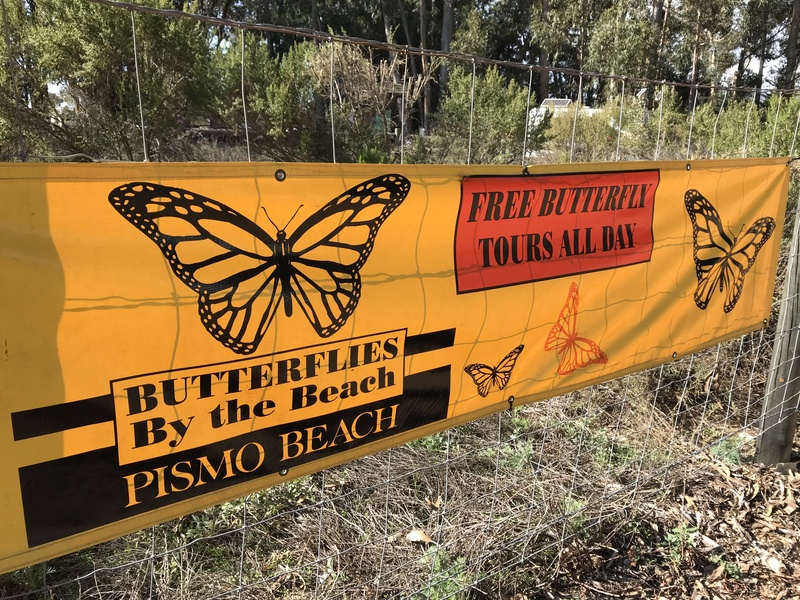 Make plans to visit the Central Coast, especially between November and February, and stop by the Pismo State Beach Monarch Butterfly Grove. Then, prepare to be amazed. The spectacle of hundreds or thousands of Western Monarch Butterflies floating and flitting overhead is a memory you’ll always remember. Or do both – they’re even better together.